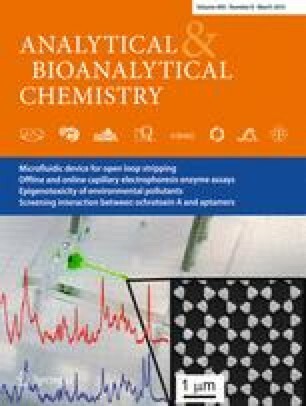 An efficient method for analyzing illegal and medicinal drugs in whole blood using fully automated sample preparation and short ultra-high-performance liquid chromatography–tandem mass spectrometry (MS/MS) run time is presented. A selection of 31 drugs, including amphetamines, cocaine, opioids, and benzodiazepines, was used. In order to increase the efficiency of routine analysis, a robotic system based on automated liquid handling and capable of handling all unit operation for sample preparation was built on a Freedom Evo 200 platform with several add-ons from Tecan and third-party vendors. Solid-phase extraction was performed using Strata X-C plates. Extraction time for 96 samples was less than 3 h. Chromatography was performed using an ACQUITY UPLC system (Waters Corporation, Milford, USA). Analytes were separated on a 100 mm × 2.1 mm, 1.7 μm Acquity UPLC CSH C18 column using a 6.5 min 0.1 % ammonia (25 %) in water/0.1 % ammonia (25 %) in methanol gradient and quantified by MS/MS (Waters Quattro Premier XE) in multiple-reaction monitoring mode. Full validation, including linearity, precision and trueness, matrix effect, ion suppression/enhancement of co-eluting analytes, recovery, and specificity, was performed. The method was employed successfully in the laboratory and used for routine analysis of forensic material. In combination with tetrahydrocannabinol analysis, the method covered 96 % of cases involving driving under the influence of drugs. The manual labor involved in preparing blood samples, solvents, etc., was reduced to a half an hour per batch. 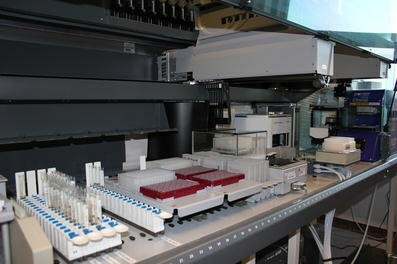 The automated sample preparation setup also minimized human exposure to hazardous materials, provided highly improved ergonomics, and eliminated manual pipetting. The authors would like to thank Suzanne Nielsen, Marianne Rosenberg, and Jonas T. Froholdt for excellent technical assistance.